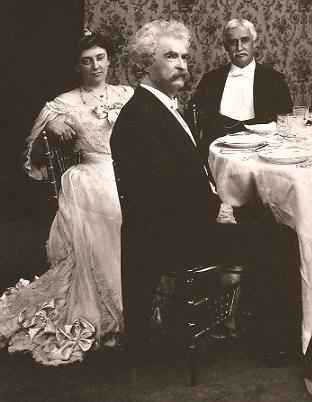 birthday celebration, 1905. The observance of Thanksgiving Day -- as a function -- has become general of late years. The Thankfulness is not so general. This is natural. Two-thirds of the nation have always had hard luck and a hard time during the year, and this has a calming effect upon their enthusiasm. Thanksgiving Day. Let all give humble, hearty, and sincere thanks now, but the turkeys. In the island of Fiji they do not use turkeys; they use plumbers. It does not become you and me to sneer at Fiji. Thanksgiving Day, a function which originated in New England two or three centuries ago when those people recognized that they really had something to be thankful for -- annually, not oftener -- if they had succeeded in exterminating their neighbors, the Indians, during the previous twelve months instead of getting exterminated by their neighbors, the Indians. Thanksgiving Day became a habit, for the reason that in the course of time, as the years drifted on, it was perceived that the exterminating had ceased to be mutual and was all on the white man's side, consequently on the Lord's side; hence it was proper to thank the Lord for it and extend the usual annual compliments. You ask me for a sentiment which shall state how much I have to be thankful for this time. For years it has been a rule with me not to expose my gratitude in print on Thanksgiving Day, but I wish to break the rule now and pour out my thankfulness; for there is more of it than I can contain without straining myself. I am thankful -- thankful beyond words -- that I had only $51,000 on deposit in the Knickerbocker Trust, instead of a million; for if I had had a million in that bucket shop, I should be nineteen times as sorry as I am now. Trusting this paean of joy will satisfy your requirement, I am Yours truly, Mark Twain. "What I Am Thankful For," New York World (26 November 1905) statement about his campaign against King Leopold's rule of the Congo. Mark Twain asks what God might be thankful for while Russia is oppressing the Jews and King Leopold is committing atrocities in the Congo.